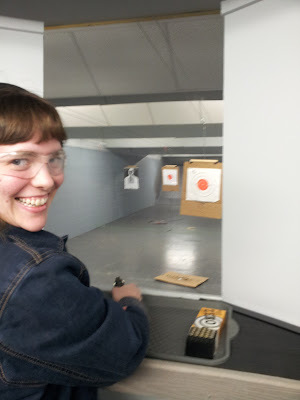 While we were in Alabama a friend of ours took us to the free ladies day at the local gun range. We really had alot of fun! 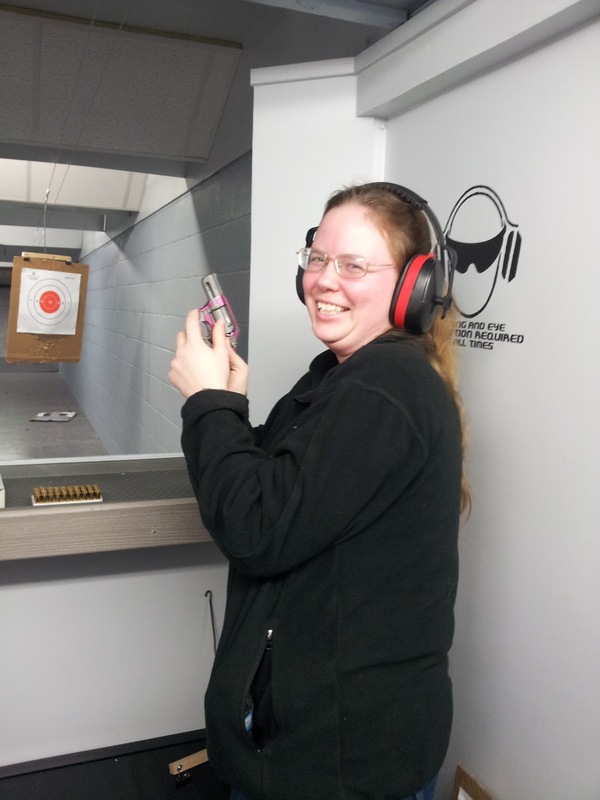 I haven't fired a pistol in several years, so we had to practice some before we could even hit the target! Check out the pictures below. We were able to use two different 38's, a 22, and a 9 mil Glock! 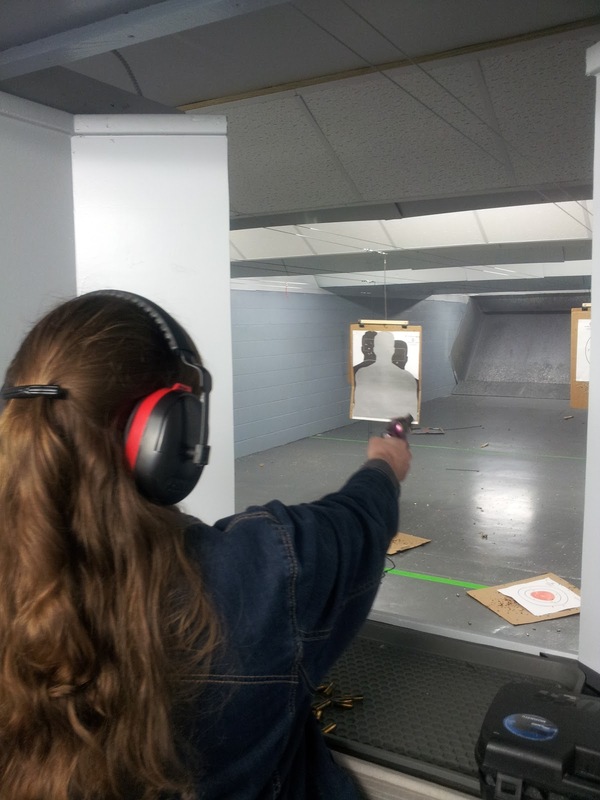 My daughter is now desiring a Glock. She was shooting the pink 38. 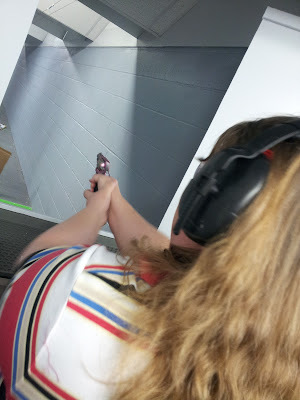 Here I was shooting the pink 38. 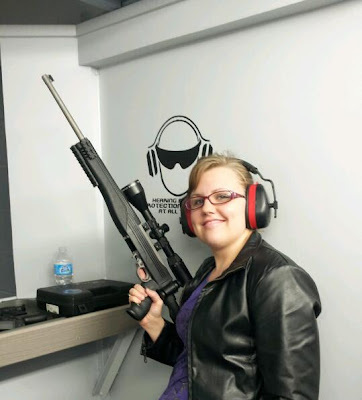 She would like to have all her guns pink! The range is not far from the base, so you see quite a few military men there shooting away. We had a GREAT time! Then we went bowling on the base for quarter night! Each game is a quarter and shoe rental is fifty cents. What a fun night, we had 24 people bowling on 5 lanes! Not only did they have cheap bowling, but hot dogs were $1.25, fries were $1.00 and sodas were 0.75. Nice! I sat and watched as I do not think bowling would be good for my back, but I still had a great time talking, snapping pictures and laughing at mistakes! H on the left and a friend on the right. This is one of the girls who went to the range with us. 2 of our other friends! Her sister is the one above in the pink shirt. it was fun watching some of the different styles of bowling. A few of them bowl regularly, but several walk up to the lane, swing the ball back and forth and then drop it. The littlest ones used the gutter guards. It was funny watching the ball zig zag down the lane before knocking over pins! Looking forward to sharing some more of our adventures in Florida! Looks like a great time. I have always want to go to a shooting range. What a great deal you got on the bowling, my family loves to bowl.